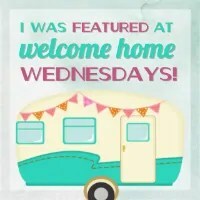 Welcome to Welcome Home Wednesdays #91!!! Hello! Thanks for stopping by week after week! I’ve been super busy here, but the sun was out yesterday and I played a little hooky. Shhhh, don’t tell anyone. I’m working extra hard today to make up for it! Like any good hosts we’re sitting right by the present table waiting until our guests leave so we can go through the loot… the loot being your Welcome Home Wednesdays #91 links! We can’t wait to check out what you’ve left for us. Trust me there will be a lot of pinning, tweeting and facebook sharing going on in the near future… we can’t wait to show off what you’ve left! Thanks for partying with us! We appreciate you being here! Thank you Erin for co-hosting the 91st Welcome Home Wednesday, appreciated. Great to see you here, Joy! Hope all is well! Enjoy your Mother’s Day! Thank you for the opportunity to bring so many gifted bloggers together! Have a great week and I hope to see you at #overthemoon on Sunday and #thursdayfavoritethings! Do something special for yourself this week! Have a good Mother’s Day! I agree, so many gifted bloggers! Thanks for stopping by, Marilyn! Hope you have a wonderful Mother’s Day! Erin, thank you for hosting. Hope you have a happy Mother’s Day. Hopefully it will be sunny!